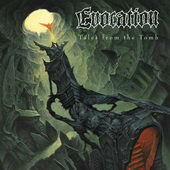 EVOCATION brought a lot of memories to my mind. Times when the most underground metal scene were watching very close death metal groups of Sweden. Times when we made games as how many groups from upthere we knew, when all fanzines where asking all groups which Swedish band was their favorite. Sunlight studios were something like a legend, and bands likeENTOMBED, DISMEMBER, GRAVE , EDGE OF SANITY, UNLEASHED, THERION etc (too many, eh?) where on the top of our list (and still are). Well, since then some things have changed and some others not. Tape-trading does not exist anymore, this sound has been limited, but Sweden still produces a lot of death metal and there are a lot of bands that continue with this sound, with EVOCATION being one of them. Tales from the tomb is their debut album but you have to know that their existence starts back in 1991. They released two demos back in 1992, that received very good reviews. These demos can be found in the Evocation compilation CD which saw the light of the moon in 2004. As for their style, as you can imagine it is death metal with references to ENTOMBED, DISMEMBER (I would say the Massive Killing Capacity era) and EDGE OF SANITY. The production has the classic sound of guitar with much strength that looks like boulder; the Sunlight sound, you know. The first track, The Dead, accumulate above it all the characteristics that make it a definition of this style of music. I also enjoyed very much Chronic Hell, with a good refrain, and my favorite Blessed Upon The Altar. We can also find a cover on But Life Goes On of the mighty ENTOMBED (by the way, check their new one). The other songs are above average, many of them have nice melodies, but if you are a freak of Swedish death metal you will not find something new or extremely good and heartbreaking here. Most of these riffs have been 'listened' before. Of course, this thing does not say anything. I enjoyed this CD, but if you miss something of the other bands I mention above you should check them before. I will wait for their second attack.